Fifty-eight consecutive cases submitted to esophagectomy and gastric transposition because of advanced achalasia were followed prospectively. All patients underwent endoscopy and acid secretion studies both pre- and post-operatively (6 and 48 months after resection). 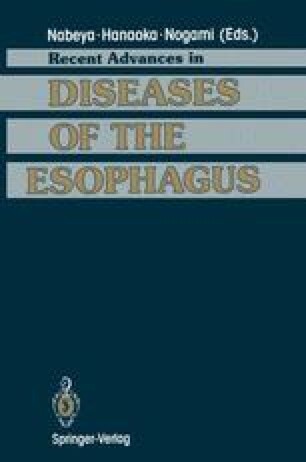 Esophagitis was observed in 7 cases after 6 months (15.9%) and 24 cases at the second evaluation (41.3%). Of these, 12 complained of heartburn (50%). In 4 of the 58 cases (7%), ectopic columnar epithelium ranging in length from 1.5 to 3.0 cm was observed in the esophageal stump. An ulcer was present in one case and intestinal metaplasia was diagnosed in another. All subjects were treated clinically with continuous antacid therapy, mandatory in 8 cases. Regurgitation and bile in the transposed stomach were noted frequently (50%) in cases with and without esophagitis. Regarding preoperative status, basal and stimulated acid output decreased in the first p.o. evaluation but increased over the long term, and higher mean levels were observed in the group with esophagitis. In conclusion, reflux esophagitis was found to occur even after high anastomoses positioned above the aortic arch. Furthermore, as the period of observation increases, the incidence and intensity of reflux esophagitis rise due to greater exposure of the stump to reflux, regurgitation, and the constant presence of bile and progressively higher acid output in the transposed stomach. Endoscopic follow-up is mandatory because of the possibility of developing ectopic columnar epithelial lining. Lastly, employment of the stomach after esophagectomy is not contraindicated by esophagitis.